Kraków’s claim to fame as one of the most attractive places in Europe is well-deserved. Voted as number one destination for European city breaks in 2014, listed among top 10 cities in the world by CNN, and hailed as a top place to be by Lonely Planet, it is the number one tourist spot (visited by a remarkable 12.1 million tourists last year!) in Poland. Why is Kraków So Popular with Tourists? Most visitors are attracted to the medieval, 10-acre Main Market Square with the imposing Cloth Hall and the Basilica of St. Mary’s (and its somber legends of the bugle call, and two brothers, the builders of the twin towers). Another must-see landmark is the iconic Wawel Castle on the Royal Hill, overlooking the Old City, with the legendary Wawel Dragon spitting fire from its den. The last obligatory item on the list is the Old Jewish Quarter, established in the 14th century by the King Kazimir the Great, the center of the Jewish community in Kraków for over 500 years. Some tourists are interested in the city’s museums. The most popular include Oskar Schindler’s Factory, showing the history of the Nazi ghetto in the Podgórze district and revealing the city’s landscape during the Second World War, Rynek Underground – unearthing the mediaeval walkways of the city, or The Home Army Museum, dedicated to the Polish Underground Movement that opposed the Nazi rule during WW2. But what if you’re not a typical tourist? Kraków is known for its chilled-out atmosphere, lazy pace, the poetic, dreamy ways (Wisława Szymborska, Czesław Miłosz, Stanisław Lem, Sławomir Mrożek – they all lived here), and there’s a better way to experience that than joining a guided tour. Do Kraków like a local! Let me show you six places that a typical ‘krakus’ would visit on different occasions. You’ll see where the locals eat, relax, meet with their friends and relatives.It’s a non-exclusive, slightly biased and subjective list. But I was born and raised here so you can take my word. Tip: Four days in Kraków should suffice to see the spots I listed (plus the typical attractions), but to live and breathe the city, you should book some more time, hang around lazily in gazillions of cafes and restaurants, sleep till noon, and take it easy. That’s the local spirit! Let’s start with the basics. There are supermarkets and convenience stores on every corner in Kraków. However, weekend shopping at the local food markets is a tradition that has never gone out of fashion. 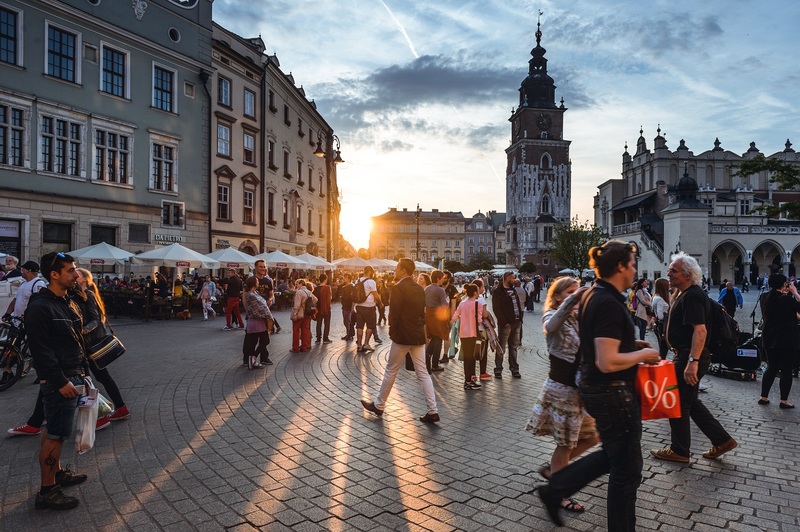 Three of the most popular local markets in Kraków are Hala Targowa, Stary Kleparz, and Plac na Stawach. 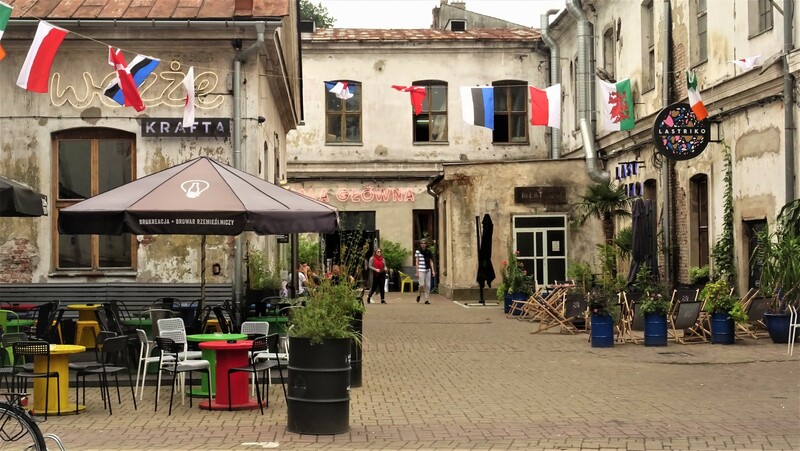 They offer the best Polish produce: fresh fruit & vegetables, wild berries and mushrooms, local cheese (oscypek, bundz, twaróg), a variety of Polish bread products, delicious ham and meat (venison or horse included), dairy – kefir, buttermilk, curd, and other high-quality delicacies. Polish food is not all about kiełbasa and pierogis! On Sundays at Hala Targowa, there’s a regular flea market. Dive into a treasure hunt for ridiculously cheap furniture, vintage clothes, and jewelry, vinyl, or the World Wars collectibles. This is an ultimate old-school food truck. 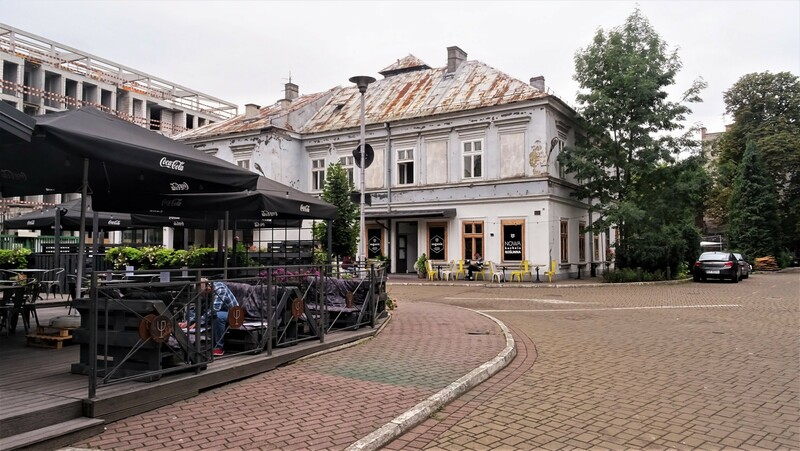 The policemen and the outlaws, taxi drivers and their clients, tourists, students, business people, local elites, … They all come here together at night for a bite of wholesome Polish barbecued kiełbasa with a fresh bread roll and a splash of oranżada. The blue Nyska van serves nothing more. Simplicity and uncompromising quality. That’s the recipe for success. I was eating here regularly when I was a little girl. I gave up when I turned vegetarian a few years ago. Every time I pass by now, the smell unfailingly makes my mouth water. Open Monday to Saturday (no work on Sundays and Holidays), 8 p.m. – 3 a.m., in front on Hala Targowa. Our Sunday roast is chicken soup, schabowy (breaded pork cutlet) and kompot. But with restaurants galore, Kraków is a gourmand’s delight! And Poles love eating out. Here are the two top spots that have become all the rage in the last few years among the locals. Dolnych Młynów 10 and Krupnicza Street: Dolnych Młynów has it all – the cool, the hipsters, the juiciest meateries and all-vegan bistros. A converted tobacco factory turned into an industrial complex of restaurants and cafes. The place is enormous (15,000m2), and its artsy atmosphere is especially compelling in the summertime. The neighboring Krupnicza offers a stunning variety of food considering its narrow size. I recommend the excellent Pod Norenami vegetarian Asian restaurant. Slightly on the expensive side, but always worth it. Kraków loves street food, and if you’re lucky, you’ll come across a food truck festival at Galeria Kazimierz (near the Vistula River bank) in the summer. Loads of delicious food there! 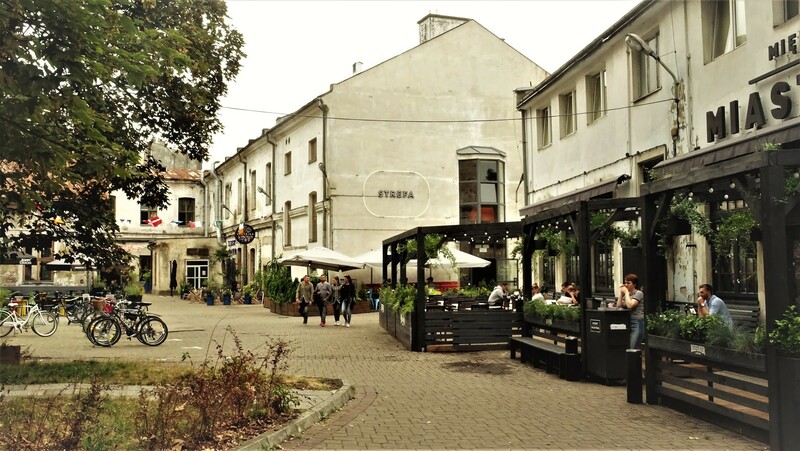 The Mostowa Street is a tiny street leading from the Wolnica Square to the Vistula River, to Father Bernatek Footbridge, or how the locals call it: “Kładka Bernatka.” Many locals come here to escape from the bustle of the Old Jewish Quarter. 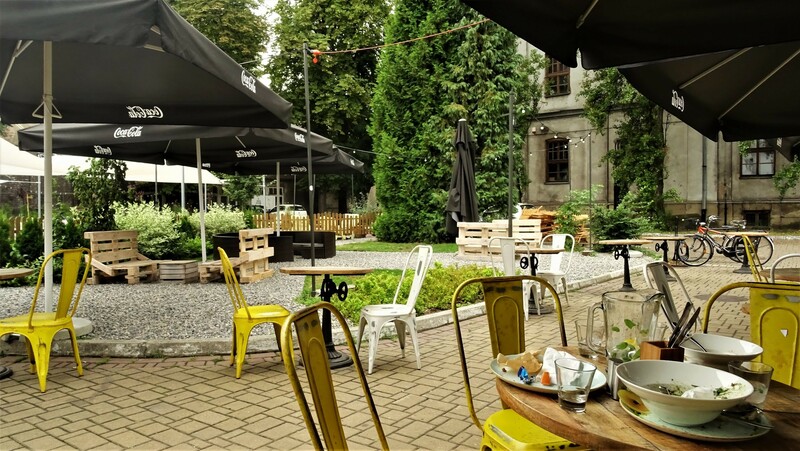 Several decent and modestly priced restaurants, cozy cafes, and craft beer pubs line up the street, while Kładka Bernatka is a favorite spot for wedding photo shoots, romantic strolls, and marriage proposals. It has its charm, especially as dusk falls. When you’ve absorbed the view, it’s good to cool off. Take a short walk down the river and turn left at the next bridge into ul. Starowiślna. The above picture wasn’t taken in the 1980s when toilet paper was rationed in Poland. This is a contemporary photo showing a line to get ice cream. As with the kiełbasa, this ice cream has been there since I can remember. As was the queue. The ice cream is divine. No artificial ingredients, several flavors. Served in the summer only. If you’re lucky (depends on the day and availability), try wild strawberry. 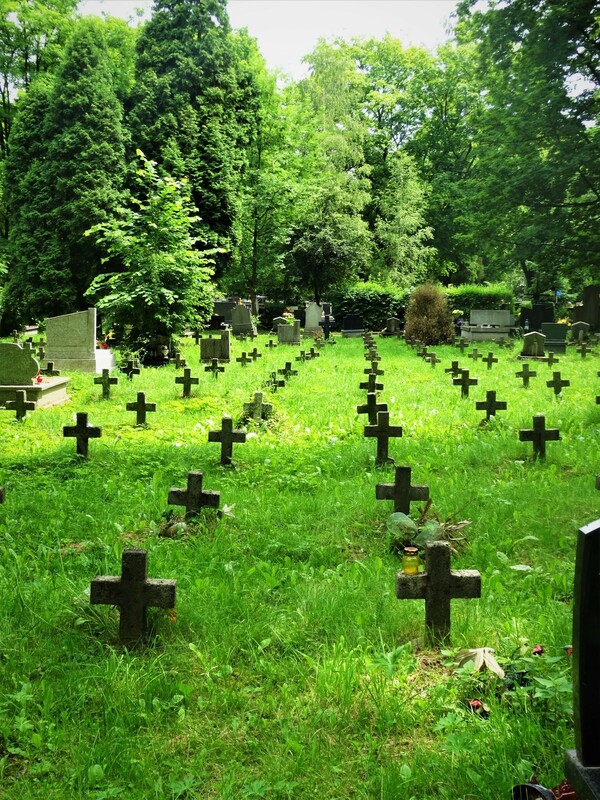 Visiting family graves is an important and integral part of our culture, and we do it regularly. 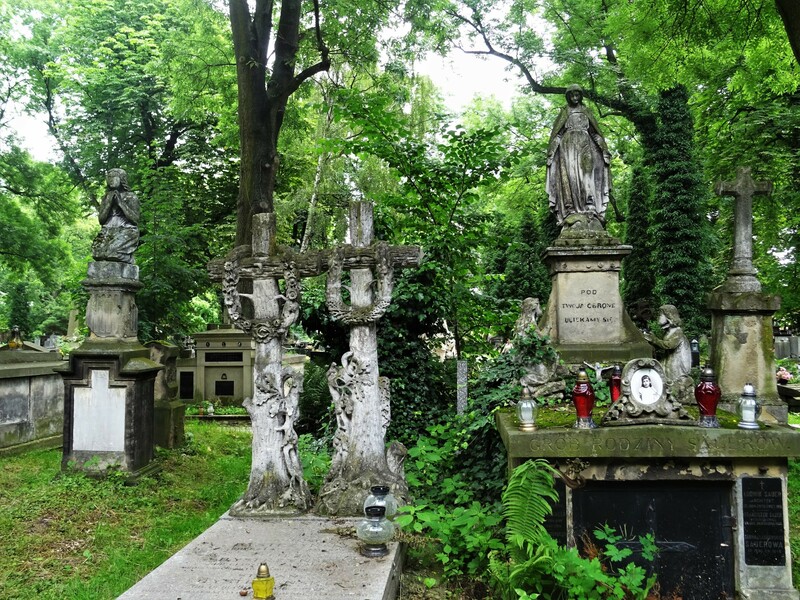 Cmentarz Rakowicki, a green alcove in the city center, is an actual eye candy, with spectacular family tombs and graves of prominent Polish politicians, artists, athletes, and journalists, including Wisława Szymborska, Tadeusz Kantor, Oskar Kolberg, or John Paul II’s parents. 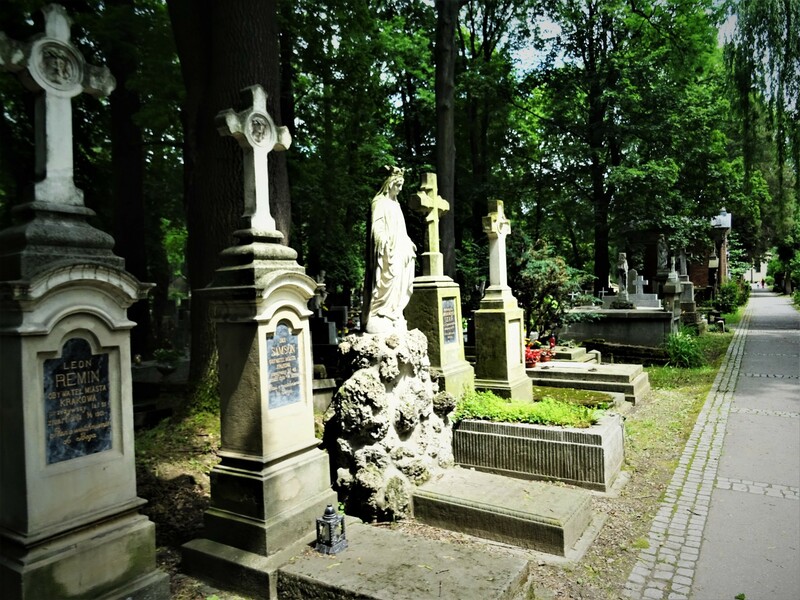 Take a stroll, enjoy the nature, and admire the beauty of the Polish religious stone craft as you walk down the alleys. Some of the tombs are genuine works of art! 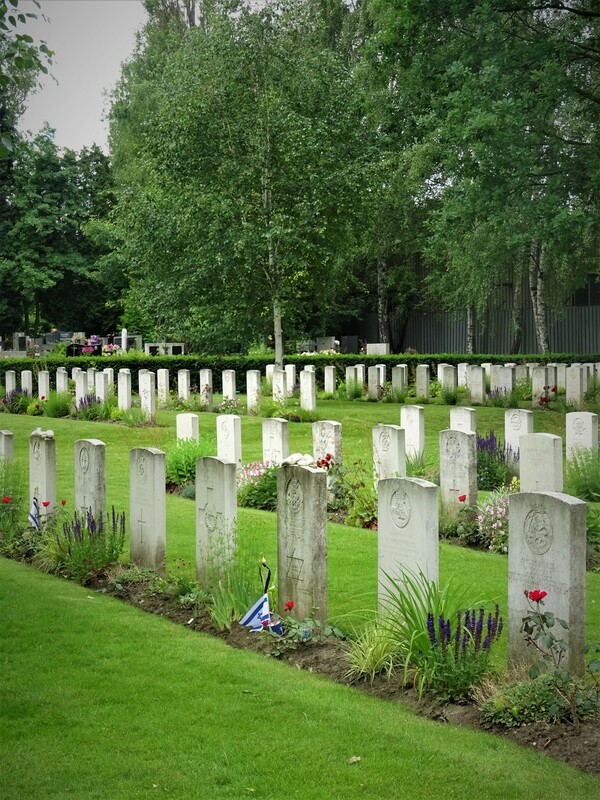 The Prandoty cemetery, just across the road, is a military graveyard. 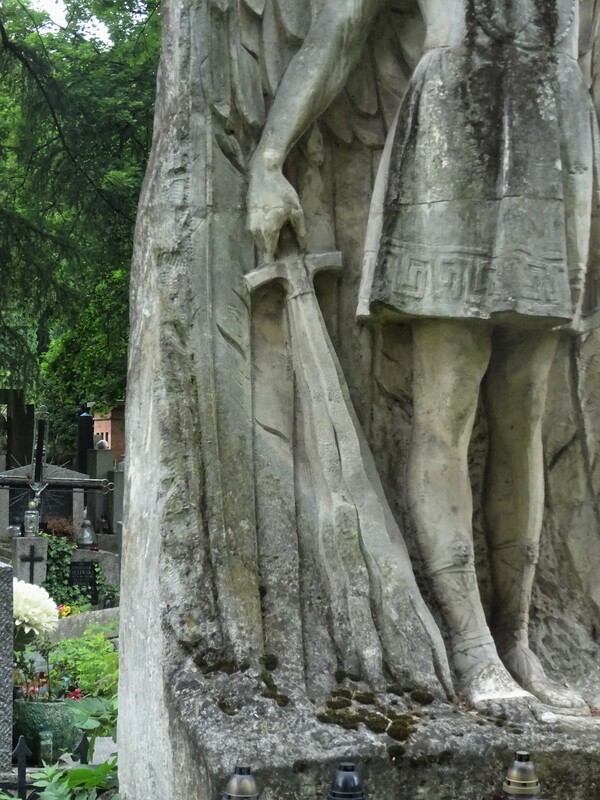 Interestingly, it is a cemetery not only for the Polish soldiers who died in the Polish-Soviet War, WWI, and WWII. 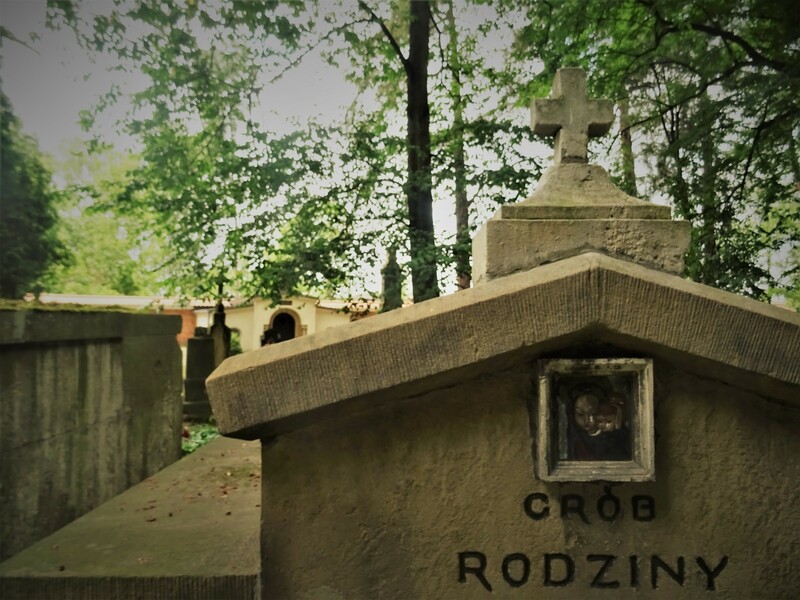 There are numerous graves of German and British soldiers and captives, and a section where – controversially – the Red Army soldiers were buried. If you visit Kraków around All Saints’ Day, check out the stalls selling votive candles. At this time they will also stock the so-called ‘miodki tureckie,’ or ‘Turkish honey’ – incredibly sweet caramel candies with nuts. The sweets are only sold locally, in Kraków and the surrounding villages. Zakrzówek is a Croatian marvel in the heart of Kraków (a stone’s throw from the Wawel Castle). It’s a limestone-brimmed reservoir with the irresistible azure water, surrounded by bushes. Swimming used to be officially banned here, but now you can enjoy the allure of this place on a guarded beach. There’s even a scuba diving school operating on its grounds. An entrance fee applies ($2.75 without concession, discounts available for children and senior visitors). Kryspinów, another popular swimming spot, is the most commercial option. Usually, the most crowded, too. If you don’t mind busy beaches, loud music, and you’re looking for fun & entertainment more than chill out and relax – this is the best recommendation. Bagry is my personal favorite as the place offers attractions for everyone; there’s a yacht club, a restaurant, and a pizzeria, you can rent a paddle boat or a jet ski, or reel one in. If none of this appeals to you, you’ll easily find a quiet spot for an undisturbed nap. The access is free of charge. I hope you enjoyed the list, and are already checking your favorite flight scanning app for cheap flights to Kraków! More historical museums are listed here: http://www.mhk.pl/news. A broader list including museums of art, technology, history, and other (e.g. Kraków Christmas Szopka Nativity Scenes) is available on this page. If you liked my article, and are looking for some further advice on your trip, drop me a note! THANK YOU for mentioning Marchewka z Groszkiem – Ul. Mostowa ! We ate there a lot. They were such lovely staff and the food was delicious! Sure! That’s one of my fav places to go when I’m in the mood for some Polish cuisine. And U Doroty in ul.Augustianska, also in the Kazimierz district. Both serve genuine, yummy, inexpensive Polish food.